This project has been carried out by Material Economics, with the support of Climate-KIC, ClimateWorks, Ellen MacArthur Foundation, Energy Transitions Commission, European Climate Foundation, MAVA Foundation, and SITRA. 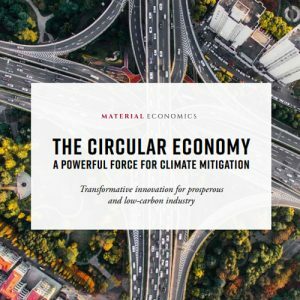 This report investigates how a more circular economy can contribute to cutting CO2 emissions. It explores a broad range of opportunities for the four largest materials in terms of emissions (steel, plastics, aluminium, and cement) and two large use segments for these materials (passenger cars and buildings). The key conclusion is that a more circular economy can make deep cuts to emissions from heavy industry: in an ambitious scenario, as much as 296 million tons CO2 per year in the EU by 2050, out of 530 Mt in total – and some 3.6 billion tonnes per year globally. Making better use of the materials that already exist in the economy thus can take EU industry halfway towards net-zero emissions. Moreover, doing so often is economically attractive. Initiatives for a more circular economy therefore deserve a central place in EU climate and industrial policy. Section 6 (page 140) focuses on the built environment and recognizes designing for deconstruction and reuse of building materials as a key circular economy opportunity.